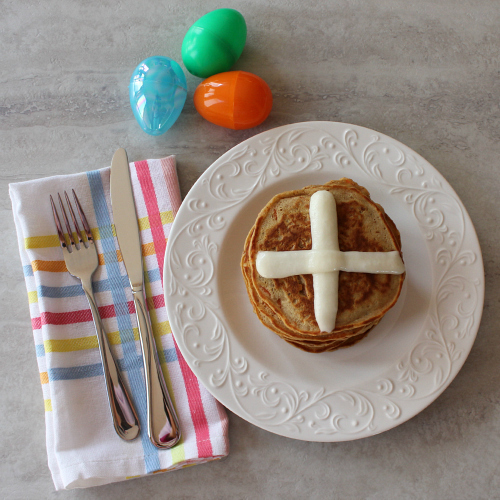 when i think of easter, two treats that automatically come to mind are hot cross buns and carrot cake. over easter weekend i decided to combine these two traditional easter treats for breakfast. 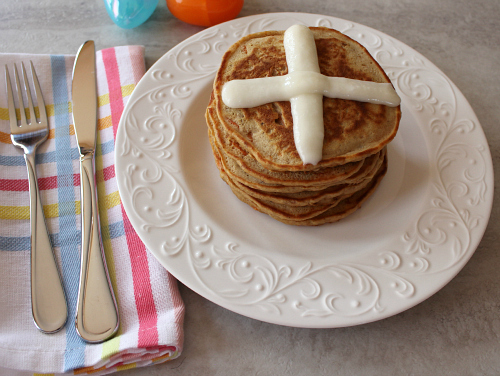 thus, hot cross carrot cake pancakes! hot golden brown pancakes crossed with cream cheese . 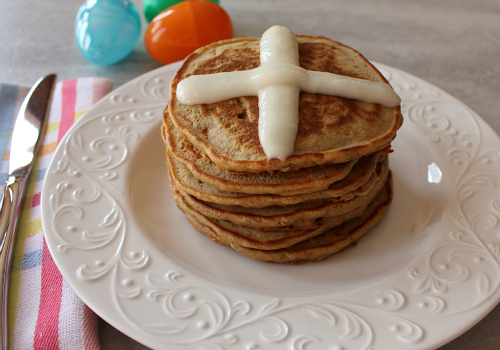 . .
these pancakes are full of carrots and spices which make them taste just like traditional carrot cake. you can add walnuts and raisins to them too. carrots, walnuts, and raisins . . . let's just call these "healthy" pancakes. what a perfect excuse to eat "carrot cake" for breakfast! to make the pancakes, in a large bowl whisk together the egg, brown sugar, buttermilk, and vanilla. sift the flour, baking powder, baking soda, salt, and spices into the mixture and whisk well until combined. stir in the carrots, walnuts, and raisins. heat a lightly buttered griddle or frying pan on medium heat. pour 3 tablespoons of batter onto the griddle for each pancake. flip the pancakes when they start to bubble. cook until each side is golden brown and the pancakes are cooked throughout (about 2 minutes per side). serve hot with cream cheese topping. to make the cream cheese cross, stir together the softened cream cheese with 3 tablespoons of powdered sugar and 1 teaspoon of half-and-half. add more powdered sugar and half-and-half as needed to reach the desired consistency. spoon the mixture into a resealable sandwich baggie. use scissors to cut one of the corners off the baggie and squeeze the cream cheese mixture onto the pancakes. These sound delicious. Dad loves carrot cake so I will have to make them for him.